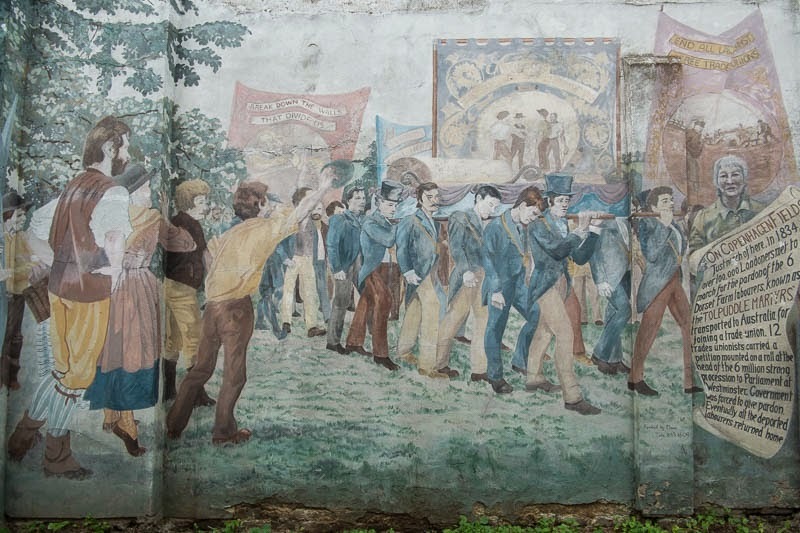 Painted on a wall in Camden is this tribute to the Tolpuddle Martyrs. Who were they? Well they were agricultural labourers who worked on farms around Dorset during the 19th century. Landowners of the period kept cutting wages until the labourers rebelled. They formed a secret society to enable better organising of their protest. One landowner decided he wasn't having a bar of this and wrote to the prime minister demanding that they be charged under some obscure 18th century law that forbade people swearing oaths to one another. Makes me wonder if marriage is legal then. That aside, the leaders of the friendly society were duly charged and convicted. Their sentence was to be be shipped out to Australia. You did know all those Aussies are a bunch of criminals didn't you? The sentence did not go down very well with the population at all. The protest grew even bigger. Marches and petitions ensued until the government relented and brought the men back from Australia. Well not quite all of them, a couple of the men who had other convictions remained there. Nice Mural. These early pioneers of trade unions had a tough time but they did make a lot changes that we still get benefit from today. I suspect marriage came under Canon Law, the law of the Church of England and therefore separate. The early martyrs suffered but succeeded eventually. A good mural. Unions certainly have had and continue to have an impact on our lives today.